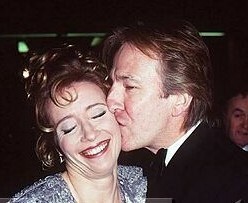 Alan kissing Emma. . Wallpaper and background images in the Alan Rickman club tagged: alan rickman rickman alan thompson emma. This Alan Rickman photo contains picha, headshot, and closeup. There might also be suti biashara and biashara suti. That's cute. I guess it was around 1998, when they were working on Winter Guest. Awww. I guess they're best friends. They're in a lot of movies together - including HP!! And he looks kinda like Sean Bean in his pic.